There is an old Latin proverb fortuna favet fatuis, which translates to fortune favors fools. Many know this proverb from first-hand experience, of course. Like when we have practiced some feat for a considerable amount of time, do everything by the book, and then some new-comer without an ounce of rehearsal marches in, does something completely opposite to conventional wisdom and ends up performing better than us. Sometimes stupidity can be offset by sheer luck. Unfortunately, I have certainly been a fool, but without much fortune in my AFOL hobby. During the past year and a half I have meticulously documented the lessons learned, and yet it seems I haven’t really learned anything at all. My quest for Inter-City train is certainly a mess of gigantic proportions. As I documented recently, I have an immense pile of assorted LEGO boxes and bags with both new and old LEGO, my old, store bought, BrickLinked, what not. This is addition to a haphazard collection of decades-old containers housing the remains my childhood collection. Pretty much the only inkling of organization is the sorted grey and black parts. One issue, certainly, is the fact that I still lack an organized building space – as I pondered in my article on why adults build LEGO. Once I get around to it, I intend to organize the pieces as well as arrange for some dedicated working space, that will also reduce the need for storing incomplete parts in random containers all over the home. Finally, a more stable setup should help with the one thing that seems to require the most concentrated effort on this blog, taking photographs. That leaves (at least) one thing: bookkeeping. I broached the issue in my original quest for Lion Knights’ castle, when I ignored perfectly good advice (surely sign of a fool, fortuitous or not) to concentrate my brickquisitions into as few BrickLink orders as possible. I had some rationale for not following the advice, mainly wanting to go step by step, to discover these things on my own and get to report on them too. I also found it a little unmotivating to simply go through my bricks in a bookkeeping exercise, fill some Excel, update a wanted list on BrickLink and then hit order. Yet, after a year and a half, it is hard to argue with the advice I got so very early on. Sure, I got my journey and got to learn first hand how vast the collection of different LEGO bricks is (and in comparison, how insignificant mine). But at the same time, both of my “quests” so far, have stalled immediately upon start due to lack of baseplates. The reality isn’t that, yeah I kind of miss a piece here and there and can keep on building, I have missed so fundamental pieces (and so many of them), that there really isn’t much point trying until you reach a certain apex. If you start a new LEGO project with very specific requirements (such as re-creating an old set you never owned), don’t count on fool’s fortune. I certainly have had none. In the end, it makes far more sense to be organized about it, especially considering how easy it is these days. You could simply mark all your LEGO sets on BrickLink or Peeron and get immediate listings of your parts library or at least the core of it. You can also use these sites to get a detailed listing of the parts required for your new project, if it is an official LEGO set. And finally, you could always create your model on the computer first and print out listings of the parts you need. Belief can take you only so far – it certainly won’t manifest itself as studded ABS in front of you. 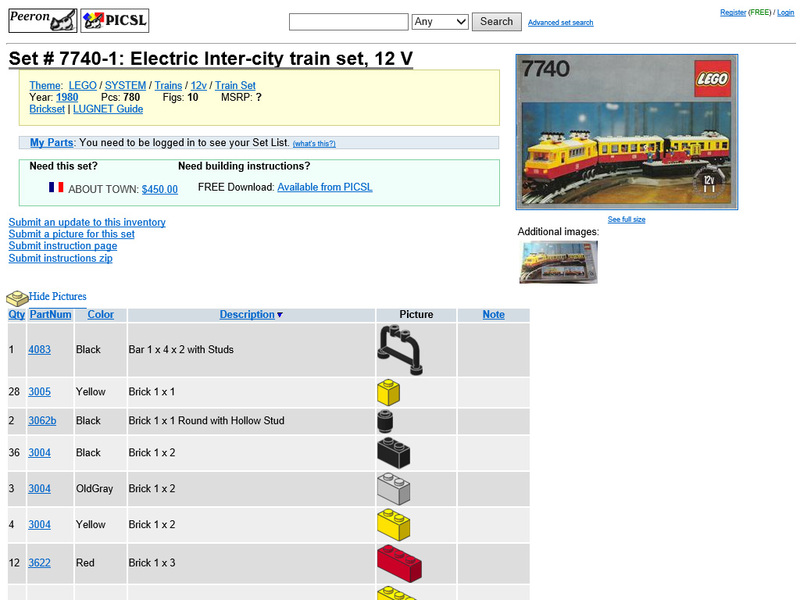 The one smart thing I did, early on in my quest for Inter-City train, was use the Peeron parts list to shop at the LEGO Shop online Pick a Brick. The downside: I kept no records of which parts I would still miss and now that time has passed, I have to start the bookkeeping exercise again. Add to this the completely uncategorized mess of extra parts I have and sheer frustration ensues. It would have been trivial to document and sort parts as I bought and received them, now it is simply painful extra duty. Not to mention the extra cost of inefficient purchases. When I started with the first quest back in early 2012, I had this romantic notion of being through my brick-pile piece by piece, building the Lion Knights’ castle – maybe occasionally picking some parts from the LEGO section of the local toy store and an online order here and there to fill in the gaps. Of course most of this notion was quickly smashed by the reality of changed LEGO colors (effectively shutting the door on any new purchases of grey and brown parts for classic sets) and lacking even the most basic pieces, not only the plates the set would stand on, but tons of others as well. You may think you have a lot of LEGO, but reality is, most of us probably don’t. What if I had started with even a cursory list of my old sets, Peeron/BrickLink and a few evenings laboring over Excel, mixing and matching…? I’ll bet you my Inter-City train would already be riding into the sunset and I’d be all over the next big thing. If I could name one mistake I have made in this hobby, aside from the occasional part blindness to the contrary, it is the mistaken notion that just because a set looks like it has a lot of familiar parts, you’re good to go. Indeed, when I tried to build a 6080 King’s Castle as a child and failed, it wasn’t for the lack of instructions (and definitely not for the lack of trying), but simply because I really, really lacked the parts. Good instructions and Internet databases can and do help, but they won’t raise castles or trains on your table – they will, however, be honest about what is needed for it. There’s a website called Rebrickable at http://rebrickable.com/ where you can inventory your parts and it will show you what you can build with it. I haven’t done it, too many parts and no desire to do a proper inventory. I know a few people who use it to keep track of stuff. Thank you for the suggestion, that sounds very useful!